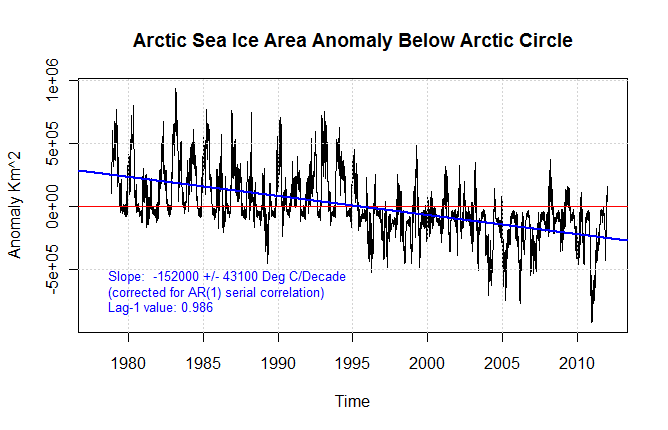 Sea ice variability within and outside the Arctic Circle | Watts Up With That? 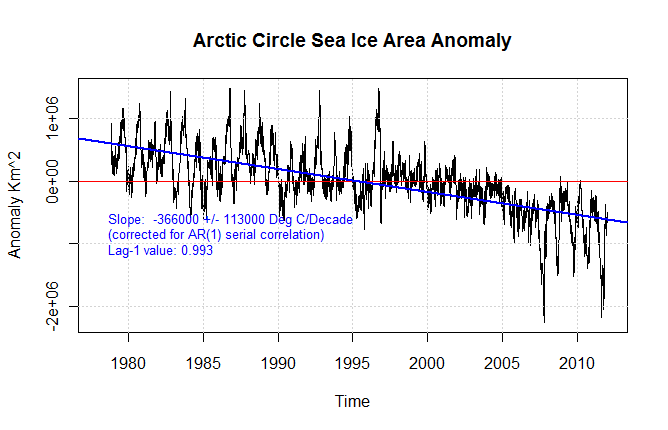 We have been looking at sea ice trends below the arctic circle at the request of Anthony Watts. It is a curiosity of his that he’s been asking Walt Meier of the NSIDC to consider for some time. I am a fan of the NSIDC because their data access is excellent and they answer questions very quickly and reasonably. This post is from the daily sea ice data as presented by the NSIDC on their FTP site. It is several gigabytes so if you are serious, fileZilla is a good free software to facilitate download. From the video’s produced, it is apparent that a lot of noisy data exists at the extreme lower edge of detection. This data results in sea ice being detected in isolated squares of warm latitudes with no chance of having actual sea ice. The effect is visible in this video showing both poles through the history of satellite ice data. You can see the great lakes around Michigan sparkle year round with sea ice detection noise yet we know that the beaches in July and August are 90F and and the only ice you will find would be in someones drink. So the false detection at the low end of the microwave sensor range is a known factor. Plotting the sea ice area outside of the circle above, we can see that the sea ice never quite hits zero. It gets pretty close though. It is interesting that the minimum value has a shift at about 1998. Fluctuations in the minimums don’t seem to have much trend so I assumed the effect is instrument related. There are a number of different instruments on different satellites which have been combined to create this trend. 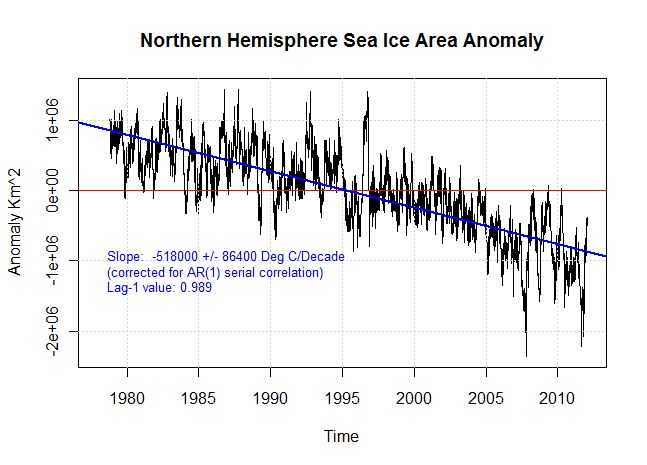 There is a statistically significant trend in the sea ice outside of the arctic circle. This ice is completely melting as expected every year so the trend we see is a result of reduced formation. I’m curious now what percentage of this new formation is in the open sea vs landlocked lakes but that will be a subject for a future post. The Arctic trend shown next is comprised of everything above the arctic circle. The trend is also significantly negative. For confirmation of the above, these results differ very little from the UIUC cryosphere page. UIUC does infill the pole hole with estimated data whereas I simply leave it out. The pole hole is the region around the pole where the satellite instruments do not reach. This region changed size early in the record leaving some difficult choices as to how to handle the newly available data. I simply used the large mask throughout the record when creating trends. My trend may be slightly more negative than theirs due to the difference but the fractional differences are very small. The purpose behind some of this work was to determine what percentage of the above trend is seasonal ice unrelated to polar cap melt. Taking 152000km^2/decade of seasonal ice out of the 518000km^2 total, that amounts to 29% of the melt trend is due to ice which, in the last 34 years, is completely seasonal in nature. 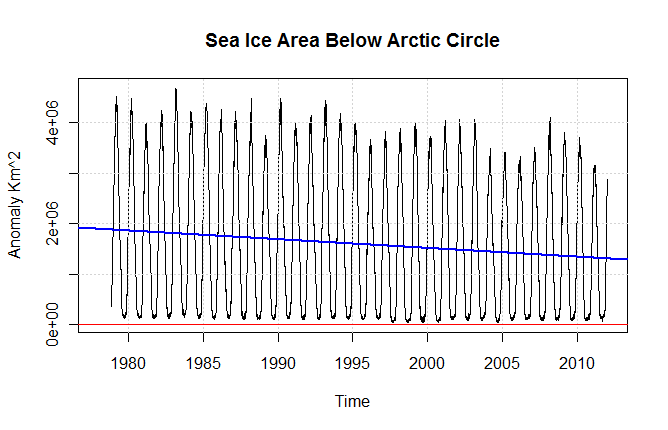 Arctic circle ice also melts every year so it is a mix of seasonal and perennial (multi-year) ice. The ratio of the seasonal ice 152000 to the mixed seasonal/multiyear ice 366000 is 41% – not sure what use that is but it is interesting to consider that the multi-year ice loss is quite a bit less than these graphs show. This next graph requires some interpretation. It is a ratio of the seasonal ice area outside the Arctic circle to the ice inside the Arctic circle. In looking at this plot, I read it by observing the annual peaks only. There is a visibly evident trend in the peak values each year. This means that the peak seasonal ice is decreasing at a higher rate than the perennial Arctic peak ice. This seems to be a confirmation of gradual warming processes controlling the peak amount as we would expect the southerly ice to show the effects first. One problem with this graph is that it reads near zero during the time of greatest melting so we really only have good information at the peaks. More work needs to be done. The next thing I want to do is look at landlocked ice to see if there are trends in satellite detection ability. After that, I have some new ideas to isolate whether the 2007 and 2010 arctic minimums were localized effects caused by ocean currents or if they were larger in scope. My focus on this now is because the data is interesting and extensive and I haven’t seen much work done on regional effects in blogland. I am very much skeptical that we should be worried about any of this. If you add up all the sea ice in the world, we have a heck of a lot of it at any given time. About 19million Km^2 on average. If you take the global anomaly and offset it by the average amount, it gives a good idea what the sea ice death spiral is working out to be. This data was compiled from the daily Ease grid files presented by the NSIDC. Code for this post his here. ice code Save it and change the extension to R as WordPress won’t allow upload of text or R files. It is written in several sections: functions, Northern hemisphere ice, Southern hemisphere ice, plotting calls etc. Authors of the various parts include RomanM, RyanO, Nic, Steve McIntyre and myself. Nearly all of their work has been modified so many times by me they may not recognize it but still deserve credit for the good parts. Any errors are my own. the southernmost portion of it melts, principally in late summer. It can and does take some parts of the fabric as long as a few decades to make the trip, but, again, it is a highly variable amalgam of ice, some brand new and some older, that sits atop the Arctic Ocean each winter. Good work. the video is sensational in the true sense of the word. Well done. I would be interested to see the scientists who frequent realclimate, make a similar study, and what their conclusions would be. One could Hope those conslusions would not be Foregone ones. I have always thought that they played around with the borders of if each NH ice section baltic etc, to fit the AGW agenda. You see that cannot be done with Antarctica because its one mass and voila! its not melting etc. It is important to note several important relationships about the “geography” of the Arctic sea extents. Current CAGW “theory” holds that Arctic sea ice is steadily and disastrously declining (even though total Antarctic + Arctic sea ice is steady), and that this decline is caused by increasing Arctic temperatures (“measured” supposedly in the interior of Russia-Siberia and Canada and extrapolated by NASA-GISS-Hansen over the Arctic by as far as 1200 km, and despite actual DMI Arctic measurements at 80 North showing average summertime temperatures at that latitude have been declining since 1958), and that such a decline in sea ice extents causes a catastrophic positive feedback of increasing ocean albedo and thus increasing heat absorption by the planet. Not at the actual location of sea ice up at the North Pole. Let us look at a real view of what would happen if (suddenly and for no assumed purpose) all of the Arctic sea ice vanished one year. 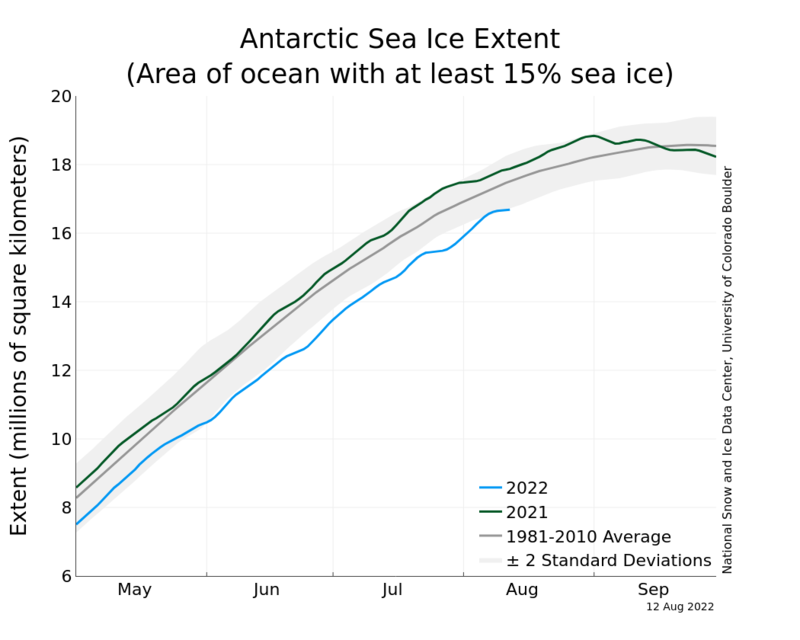 Would any positive feedback actually affecting the next year’s sea ice extent occur? 1. 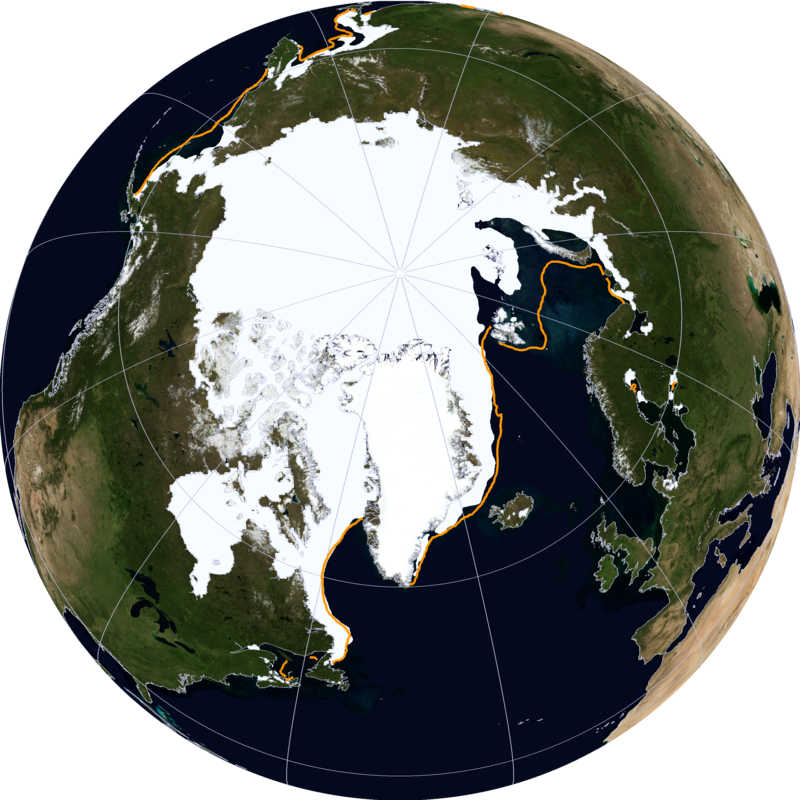 Today’s Arctic sea ice extents include vast areas of sea ice that melt regularly every summer. The minimum is reached in mid-September at just at 4.5 million sq km. The maximum sea ice extent is limited by the actual Canadian/Alaskan/Siberian and north Russian coasts surrounding the Arctic Ocean, Hudson Bay, Labrador/Greenland/Newfoundland estuaries and gulfs and channels. It is actually almost impossible to greatly increase northern sea ice “much” past the maximums of what is there now. So sea ice maximums can’t expand much past where they are now – barring a full Ice Age. At which time the sea AREA itself greatly decreases because of land-based ice/glaciers mass increases -> sea level decreases – sea ice extents reduce, so the sea ice is more than replaced by land ice reflectivity. 2. Land ice is a greatly different story. But northern land ice – the summertime coverage of land ice extents is NOT the point of issue right now. Currently only the very small northern coast of Greenland is permanently covered by land ice – the rest of the north Arctic coasts are all barren wastelands of marsh and tundra during the summer. So what the Arctic land area summer time albedo is now – is what their summertime albedo will be in the future. Regardless of how far the Arctic sea extents are reduced in any year. To repeat – if all of the summer land ice is melting now, then, all of the future land ice in this scenario has also already melted when the sea ice vanishes. No impact on global temperatures the current year, nor any in the next year. 3. At its summertime minimum, Arctic sea ice minimums are about 4.5 million km^2. This corresponds to a global “spherical cap” ranging from 79.2 latitude to the pole. In real life, the actual summertime minimums are actually nearly circular, but are slightly skewed to the side of the pole, but this is a very good approximation. We are left then with the summer ice suddenly vanishing from the region of 80 north to 90 north. Since the minimum sea ice extent now happens in Sept, it is only possible that the vanished sea ice will disappear in Sept as well. Temperatures by mid-October decrease rapidly to less than -20 C. Arctic air temperatures (now) in early September are at only +2.5 to +3 C. We MUST assume that the sea ice will begin re-freezing by mid-October. If sea ice extents vanish in Sept, but are at their maximum in February- March (as now), then the minimum ice will be less in August than now, and such reduction must be accounted for, but in September – the critical month of 0.0 sea ice, ONLY the Sept sun conditions apply to the perceived “positive feedback” nightmare feared by the CAGW extremists. So, let us focus on the potential “added” solar exposure of the Arctic Ocean north of 80 north latitude during the 2 weeks before, and 2 weeks after, the equinox – assuming, as above, that all of the ice vanished. 4. In Sept, the earth’s tilt with respect to the sun is 0.0 at the equinox (Sept 21-22 most years), and so there is NO “24 hours of summer sunlight”that can be asorbed. Sunlight (before and after the minimum at Sept 22) will be “only” 12 hours per day. At the equinoxes, at 90 north latitude, the sun’s maximum angle is no longer the 23.5 degrees angle of mid-summer (itself very small!) but 0.0 No sunlight is present at noon to heat the (now exposed) ocean surface. At 80 north in mid-Sept, the lowest point of the region of interest (highest possible sun exposure) the sun is only 10 degrees above the horizon at noon. Sin of 10 degrees is .17, so only 17 percent of the rays (measured at top of atmosphere at the equator is the “disk earth model” so favored by the CGAW theory) can heat the newly-exposed ocean surface. And that percent declines quickly every minute before and after local solar noon. 6. Atmospheric masses. The sun ray’s at the pole at Sept 22 are trying to penetrate 806 km thick “atmosphere – assuming a 50 km high stratosphere. 16 atmospheric masses. At 80 north, there is “only” 273 km of atmosphere to absorb the rays: 5.5 atmospheric masses. Even down low at 70 north, the sun must penetrate 145 km (3 air masses) before it can hit the earth/land/ocean surface. with about 15years delay . If link can be confirmed it would be a significant step towards further understanding of the climate change events. Why hasn’t this already been done by the “Professional” climate scientists? Jeff may well prove that it is “worse then we thought” when it comes to the Arctic ice melt trend. But, I have to suspect that if it were, the alarmists would have already been adding into their scare tactics? The 1998-2007 period is very interesting. It appears that there was a different weather regime existing in the Arctic that more consistently melted the ice and caused large net losses. Does anyone know of any studies that look at the differences in pressure, cloudiness, jet streams etc. for this period compared to before and after?? This is a wonderful post, Jeff and Anthony! I wonder whether you (as yet) have fitted the data of your final figure (“Global Sea Ice Anomaly Offset by Average Global Ice”) to James Hansen’s acceleration function, per Hansen’s recent article Paleoclimate Implications for Human-Made Climate Change (an article that was much-discussed here on WUWT). When we plot these numbers, we discover that a Hansen-style acceleration fit to the Condon/Watts sea-ice data robustly predicts total loss of planetary sea-ice by the end of the 20th century. This excellent agreement of skeptical-style curve-fitting with Hansen-style theory-driven prediction was very surprising and impressive (to me)! For the general public, a key question is whether Hansen’s Seven Key Predictions of Warmism come true. If these seven key “Warmist” predictions prove correct, then not only will the “Warmists” have (rightly) have won the day, but (far more importantly) the sobering severity of our planet’s climate-change challenge will be apparent to everyone, skeptic and nonskeptic alike. Jeff and Anthony, that is why I urge you to be skeptical regarding the above calculation, and therefore, to verify for yourselves the predictions that are associated to a Hansen-style acceleration fit to your data. Layman’s question….when the sun is at very low angles as mentioned above (RACookPE1978), won’t most of the light/energy simply reflect off the water? “Jeff Id”… is that Jeff Condon’s “nom de plume” ? Excellent post. Thanks. Once again, Hansen and crew report only half the equation. I find it weird that you have missed what’s going on in Europe the last couple of weeks. More than 100 dead only in Ukraine. Visually, it appears that there are periods of stability followed by a drop to a lower regime. For example in your Arctic Circle chart it appears relatively flat from 1995 to 2000 then drops until 2005 before stabilizing. 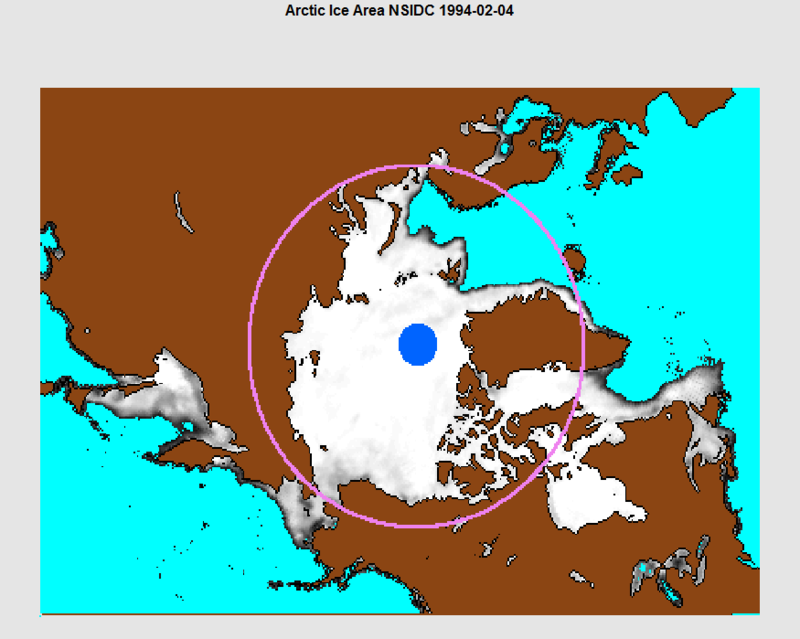 The below the Arctic shows something similar from about 1995 until just before 2005. When the two are combined the flat periods aren’t as obvious. There seem to be others in the graphs as well. As the Arctic ice extent winter max is largely constrained by the geography of the region, would it not be reasonable to assume that the negative trend would be steeper if that constraint did not exist? Hansen could take that thick atmosphere and run with it…. He claims the thick atmosphere and CO2 on Venus is what causes the runaway warming there. Since the pole’s sunlight, at that time of year, must travel though such a thick atmosphere and multiples more of CO2, that, by the Venus example, is what is causing the warming and melting at the North Pole… See? sarc. By that theory, the Arctic will be the first water to boil away… Polar Bear Tea anyone? So what happened to cause the shift in 1998? Layman’s question…when the sun is at very low angles as mentioned above (RACookPE1978), won’t most of the light/energy simply reflect off the water? Therefore, the amount of energy released from any given Arctic surface (ice, snow-covered ice, or open water) does NOT depend on solar angle, time of day, day of year, nor degree of ice coverage – only on the surface material. Radiation will be emitted from an open water surface all 24 hours per day. Snow albedo does change with angle of incidence of the sun’s rays. (Warren, 1982) but it is more strongly affected by what type of what type of snow fell, how it was blown, how compact the snow is, how long the snow has been laid down, melt rate, sublimation rate, wavelength measured etc. (Basically, no climate scientist that I’ve read varies the assumed snow albedo with solar angle.) The Arctic snow – to be present at all) MUST be on top of the ice fields over the ocean, and we assuming that the ice in Sept has all melted, therefore, there is no snow to reflect potential energy reaching the surface at all. That leaves water. Assume calm water: If there are storms (significant waves) then there are clouds present, and there is no direct sunlight. (Indirect sunlight is also either greatly diminished under cloud cover, or absent almost entirely – and we can cover that indirect radiation later.) Also, if there are waves present, then the "rise" of wave shadows the trough between that wave and the next = no solar radiation at all in the trough at all. ALL water surfaces no how rough emit thermal radiation constantly, so the presence (or absence) of waves does NOT slow the rate of cooling of the Arctic water at ANY time of day or night. All exposed water surfaces allow evaporation at a greater rate than that of snow, ice-covered water, or snow-covered-ice-covered water. The rougher the water (higher the waves) the greater the amount of evaporation into the low humidity air common at 80+ north. So, the presence of any ice at all removes approximately 80 Watts/meter of "insulation". Adding ice reduces cooling and increases heat retention in water above 80 north. Albedo and the open ocean water? Not so. And the impact of your observation is significant. Wikipedia is actually pretty thoroughly on this subject: See http://en.wikipedia.org/wiki/Albedo Solar light (heat) is commonly approximated using the average of the polarized and unpolarized light waves, or the middle line of 3 in the graphic at that page. Note that the "angle" described is angle FROM VERTICAL of the calm water's surface. In the Arctic, you have to use (90-normal angle) to understand the effect of the low sunlight incident to a sq km of ocean. in their classes for lectures, tests, and summaries! Even Curry uses only a single value of for the "ocean" albedo in her arctic research papers. The albedo changes significantly at low angles: at 30 elevation angle, albedo is still 0.07: 93% is absorbed. At 0 solar elevation angle, 100% is reflected. None is absorbed. At 6-7 degrees, 50% is absorbed, 50% is reflected from the water. This period of 0 to 7 degrees elevation corresponds to the light available between 6:00 and 10:00 am; and between 14:00 pm local solar time to 18:00 pm. Between 18:00 pm and 06:00 am, there is no sunshine at all. At 10 degrees elevation angle, 35% is reflected, 64% is absorbed. At 20 degrees elevation angle – only relevant in the early days of Sept near noon! – 15 percent is reflected, and 85% is absorbed. Therefore, during the 4 weeks that sea ice is at a minimum each year, at no time of the day is more than 35% of the maximum available solar heat ever absorbed by the water. Through most of the daylight hours when the sun IS shining, less than 20% is absorbed. Further, the amount of time that this heat is available, is NOT "24 hours of every day" but only 2-4 hours per day! True, for almost all of the rest of the summer months, the sun's angle is higher than 10 degrees, and so open water can absorb direct sunlight. But … for those months, the ice coverage now is still present, and so whether or not open water exists in Sept in irrelevant to what the sun's angle is in mid-summer. The ice will (or will not) melt between its maximum in March and its minimum in Sept regardless of whether or not there is open water present. Isn’t Mark “Death Spiral” Serreze with NSIDC? Wonder what he thinks of this analysis. If the surface of the Earth was covered in a perfect layer of artificial insulation that blocked incoming solar radiation and trapped in outgoing core heat from below ground, what would happen? The internal heat generated from within the planet would eventually heat and melt the surface of Earth, under the insulation, to become a relatively uniform molten ball of magma. It would have nothing to do with either the sun or CO2. This might be part of the problem on Venus. The atmosphere could be so thick that it is trapping the escape of the core heat of the planet. If Venus also has stronger forces acting to generate more internal heat such as: stronger gravitational forces from the sun, more radioactive decay elements, etc, then this would amplify the intensity and wattage of the core heat. Mars has more CO2 by both quantity of molecules and percent of volume in its atmosphere than Earth does. Runaway warming is not a problem there, so CO2 as a villain for warming there doesn’t exist. I suspect that Venus’ high surface temperature is greatly fueled internally by the core heat being trapped by the thickness of the atmosphere. There was never a runaway greenhouse there from CO2… it was always hot! I believe that the partial melting of ice on planet Earth is being caused by something other than CO2 alone. Keep looking. How much snow and ice will make the AGW crowd happy ? But what do they use in their models? Excellent comments, btw! Thanks for the references. I sometimes drive along a high cliff when the rising sun is 30° above the horizon, and the sunlight reflecting off the water is still too bright to look at. At times, a slight chop seems to also give high reflectance even at low solar zenith angles. Ocean albedo is very complex, even without the ice variation. A runaway greenhouse as proposed for Venus seems absurd to me. 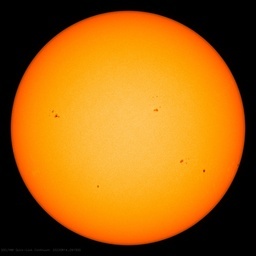 The SB equation says a radiative power of ~16101 W/sq m is associated with a temperature of 730 K whilst AGW climate scientists claim the insolation to Venus is 132 W/sq m.
That is absurd to my way of thinking – how anyone can actually keep a straight face while claiming that the greenhouse effect of an inert gas like CO2 “creates” an extra 15970 W/sq m over solar input of 132 W/sq m is beyond me. Everything in the Universe is cooling down in the absence of an external power source – even the power sources. I would like to see a study performed which compares northern ice levels with ocean temperatures from the Gulf Stream, among others. 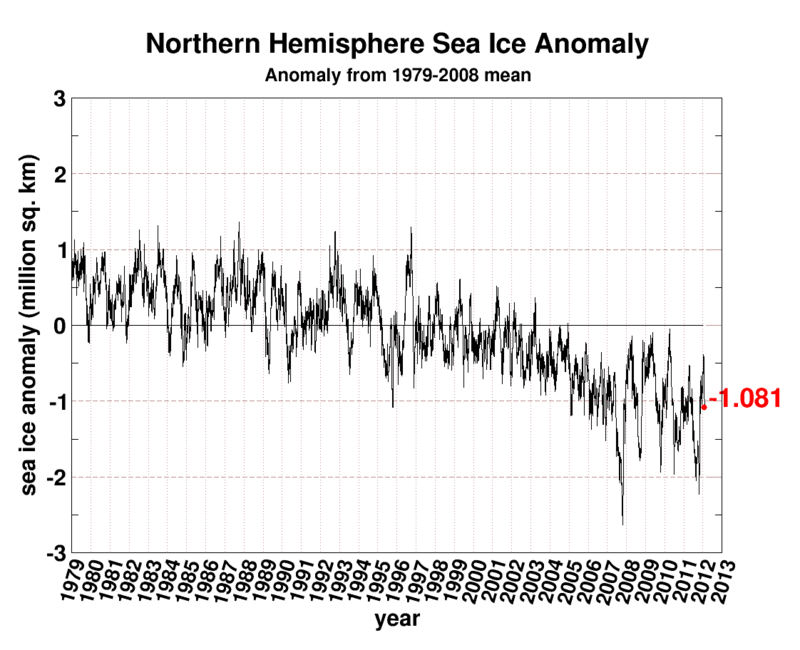 One thing I noted, is in the graph he produced “Arctic Circle Sea Ice Area Anomaly“, that the variability was high until 1998, then variability was muted with a downturn, and then went highly variable again in 2007. Curious. The explanation for this is trivial. For the “arctic-only” record, the winter maximum changes very little, because most of the winter-variable regions are outside the Arctic circle. However, the summer minimum has been dropping steadily year-on-year, so the size of the annual cycle has been steadily increasing. Using anomaly data subtracts out the average annual cycle. Thus, at the start of the data series it there will be a positive anomaly every summer, since summer losses in these years were less than the series average. At the end of the data series the opposite applies: there will be a negative anomaly every summer since the summer losses are now greater than the series average. In between the extremes, there is a stretch of a few years where this balances out, leaving no residual annual cycle in the anomaly data, and thus reduced anomaly variability for a few years. You can see this effect in the whole-hemisphere data too, it’s just a noisier because the winter maxima for the hemisphere as a whole are more variable than the maxima for the Arctic circle region. Note that both the winter max and summer minimum are trending down, it’s just that the latter is trending down more strongly. To add: the exact same effect is visible in the data south of the Arctic circle, but in the opposite direction, in the opposite season, for the opposite reason! South of the Arctic circle, the summer minimum is fixed at zero since it’s all seasonal, while the winter maximum is getting lower year-on-year. In the anomaly charts therefore, the start of the data series shows positive winter anomalies, and the end of the data series shows negative winter anomalies. Once again, the period from ~1997 to ~2006 marks the transition between the two regimes. An important fact to point out is that the “transition” is not symmetrical: there are ~18 years with the residual cycle showing one polarity, then ~10 years of transition, then ~5 years with the reversed residual cycle. Why is this? Consider the fact that the anomalies are measured relative to the whole data set, so the total sum of anomalies must be zero. i.e. the negative/positive anomalies (whichever season and region they apply to) during the most recent 5 years exactly offset the positive/negative anomalies from the first 18 years. That is, the rate of change is accelerating. Nice work Anthony and Jeff. My apologies for not getting to doing this myself, but it’s been a busy few months. I don’t see anything surprising in the analysis, but it’s interesting. While the Arctic Circle is rather arbitrary, the two areas do conform to a seasonally-dominated region and a region marked by a mixture of seasonal and perennial ice. There have been many peer-reviewed analyses of seasonal vs. perennial ice, which this study confirms. First, regarding the lake ice, I wouldn’t use this data to estimate lake ice. While it does in a broad sense capture the phase change in lake ice, the algorithms are generally derived for ice that forms in the saline oceans and thus will be less reliable for freshwater ice. Also, the spatial resolution is really too low to use with lakes due to the mixture of land and lake within a substantial fraction of grid cells around lakes. Second, as has been noted numerous times before, “global sea ice” is not a meaningful climate indicator due to the very different nature of the sea ice between the Arctic and Antarctic. Once again, nice job, and thanks! RACook: thanks for that comprehensive explanation – much appreciated. Linear trends, though loved by the warmists and used by necessity by skeptics (I presume), are frightening when projected into the future. But is not the future only as reasonable in this view if we projected similarly into the past? If the linear trend has an validity, then taking the trend to (say) 1970, should be good. But of course very quickly this would be absurd: go back to 1960 and areas of the Arctic were ice-clogged all year (like the decades of the Franklin expeditions?) when they were not. If we can’t straight-line backwards another 10 years, then why do we say we have a straight-line function? A non-linear trend is more likely to reflect real-world processes anyway, but then the future might be more friendly. And not reflecting CO2. 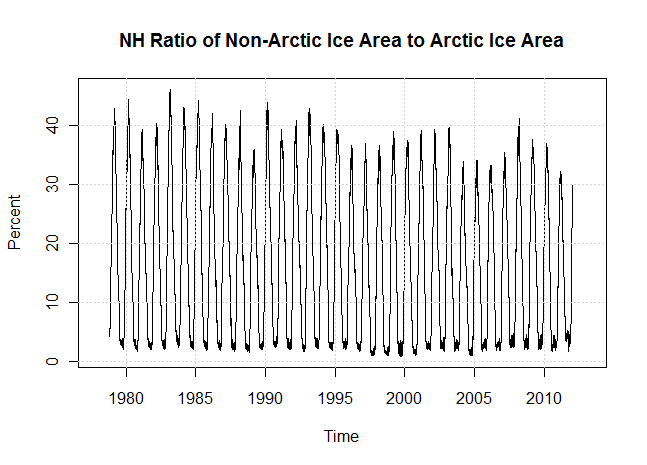 We need a better trend for sea-ice data than a straight-line. Something that can be used for predictions. If the warmists use a straight-line, fine. The skeptics need something more in keeping with skeptic models. Completely a side note. It looks like the clockwise rotation of the sea ice around Antarctica over millions of years has warn away the land into it’s current shape. Are there studies about that? I’ve been keeping an eye on weather patterns in my part of the World and how they seem to be impacting upon sea ice in the Barents and Kara Seas. Over this Winter we seemed to have had mainly low pressure systems move in from across the Atlantic and then head North towards the Barent Sea, crossing the Northern part of the UK but not impacting on the south. These weather systems have brought plenty of rain to the North but have left the South of the UK drier than normal. I point this out as it seems to be a popular theory that low ice cover in the Barents is the cause of the low pressure, rather it would appear that the low pressure systems and their related weather patterns originate elsewhere. I wish I had more time to study this as it would seem that winds blowing mainly towards the North have been a limiting factor in Barents sea ice extent this year and may also have had an impact on the normal flow of ice South into the Atlantic via the Fram Strait. Can it be a coincidece that this all seems to tie in with a colder Pacific? I didn’t understand Jeff to be suggesting that the spatial resolution should be used with lakes. I think he was pointing out that the data appears to show ice in the great lakes in July and August — which clearly cannot be the case. Are those white areas not really data? Are they included in the Arctic sea ice calculations? If they are spurious data are they usually substracted out before the data is processed? 20th century is gone, my friend. I am sure you mean the 21st century. 1) It so happened that the starting point of the satellite measurements coincided with the recent maximum ice extent and temperature dip. This coincidence is the only straw that sinking climate alarmists still hold in their hands. 2) The time scale of the existing planetary ice and climate data records is incompatible with the time scale of the significant, long-term planetary climate changes. Let’s talk some 5,000 years from now. Thank you. I’m am though a bit confused how you have projected the blue slope lines before and after satellite data collection. This would imply that one upon a time there was nothing but ice and in the future there will come a time when there is no ice. Alexander Feht says: 20th century is gone, my friend. I am sure you mean the 21st century. Regarding your other weirdly triumphant claims about “disappearing ice” … let’s talk some 5,000 years from now. Alexander, Feht, please let me say that you are entirely correct — the intended phrase was “total loss of planetary sea-ice by the end of the 21st century. For rational skeptics, there is of course nothing “weirdly triumphant” about Hansen-style predictions of total planetary ice-loss, and certainly we need not wait 5,000 years to determine whether these predictions are correct. Indeed, Hansen predicts that a marked acceleration of multiple “hockey stick” climate-change parameters will be plainly seen by the end of the next solar cycle (say, during the next 15-18 years). More broadly, rational skepticism correctly appreciates that the statement “97% of climatologists agree that global warming is largely anthopogenic” does not imply a 97% chance that Hansen’s prediction of an ice-free planet is is correct. Rather, it indicates that there is a substantial likelihood (surely not 100%, and surely not 0% either) that Hansen’s predictions are correct. Elevator Summary The Condon/Watts ice-data analysis presented is consistent with the rationally skeptical point-of-view that Hansen’s predictions of an ice-free planet are appreciably likely to be fulfilled. Hansen’s prediction on record was that, by now, FDR highway in Manhattan would be under water. Would you at least apologize 18 years from now, when there will be more Arctic ice than now? In Wikipedia GW editorial page, I predicted years ago (circa 2002) that the “total ice loss” wouldn’t happen by 2007. As a result, odious troll William M. Connolley edited me out of Wikipedia entirely. Alarmists cannot stand the truth. Alexander Feht says: Hansen’s prediction on record was that, by now, FDR highway in Manhattan would be under water. Remember the fundamental principle that skepticism and science both prosper when the the strongest skeptical criticisms are applied to the strongest scientific analyses. And conversely, weak forms of “gotcha” skepticism, as applied to weak forms of “not even wrong” science, amount to a plain-and-simple waste of everyone’s attention and time. Unless,of course, you and Mr.Hansen are suggesting global temperatures will rise enough in the next 90 yrs that not only will the Summer sea ice will disappear, but it will not reform at all in the six months of near total darkness that both regions experience annually. Or perhaps you guys believe the magically potent gas CO@ will alter planetary dynamics enough to do away with seasonality entirely. Dave Wendt says: I have a prediction that I feel is as “appreciably likely to be fulfilled” as Mr. Hansen’s prediction of a planet “free” of sea ice. I predict at some point in the future the commentor known as “A.physicist” will submit a comment here that actually suggests he possesses a level of intelligence greater than a doorknob. But on the other hand Dave, when was the last time Earth had a C02 level as high as present (anthropogenic) levels? Hmmmm … about 15 million years ago, right? Which coincidentally, is the last time Antarctica was ice-free, eh? What does rational skepticism make of that? “But on the other hand Dave, when was the last time Earth had a C02 level as high as present (anthropogenic) levels? Disregarding for the moment that your reply, as usual, completely ignores the main point of the comment you are responding too, I would suggest that the logical and rational reaction to what you wrote above would be to ask “Do we really “know” any of that?” and my logical and rational answer would have to be “Not hardly!” I can’t claim to have scrutinized every piece of paleoclimate proxy hoakum produced in the last several decades, but I have done so for a large enough sample to have established to my own satisfaction that the best that most of them could legitimately claim to produce is vague suspicions and nowhere near to “knowledge” In the early days when i had more enthusiasm and patience those examinations frequently included chasing all the way down the often more than six degrees of separation chain of logical reference between whatever precisely measured bit of minutia that served as the input and whatever proxied value they claimed to generate as output. In almost every case I found that chain of logic was full of more holes than a big wheel of Jarlsberg, Those holes included things like claims that isotope ratios that are often barely understood in the present behaved exactly as the authors wished over thousands and millions of years, papers cited as having “demonstrated” or established “knowledge” which supports the proxy process which, when examined with a critical eye, offer only as I said vague suspicions. I don’t claim to know much about what has driven, is driving,or will drive in the future the amazing climate of this planet but, after well more than a decade in rummaging about in this BS, I have come to consider anyone who confidently claims that they do as an epistemological mattress back . I disagree with Dave Wendt. I think ‘a physicist’ has more intelligence than a doorknob.☺ But his repeatedly debunked belief system crushes any rational thought. He believes what he believes; contrary facts just get in the way of his beliefs. There is nothing wrong with Antarctic ice cover. It is normal. 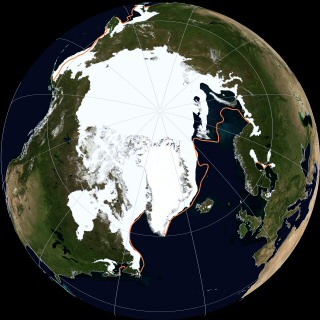 So is Arctic ice cover. See, the planet is still emerging from the LIA. Rational folks expect ice cover to diminish. It’s normal and natural. Posting yet another pal reviewed paper that tries to link CO2 with decreasing glaciation [“Decreases in pCO2 were apparently synchronous with major episodes of glacial expansion…”] is a non-starter: on all time scales, rises in CO2 follow temperature rises. How many times does ‘a physicist’ have to be told that verifiable fact? And I label as bogus the pal-reviewed authors their claimed ability to know that CO2 and temperature rises were “apparently synchronous” when looking back 15 million years. We know that in every verifiable geological instance, CO2 rises follow temperature rises. That is because warmer water outgases CO2. 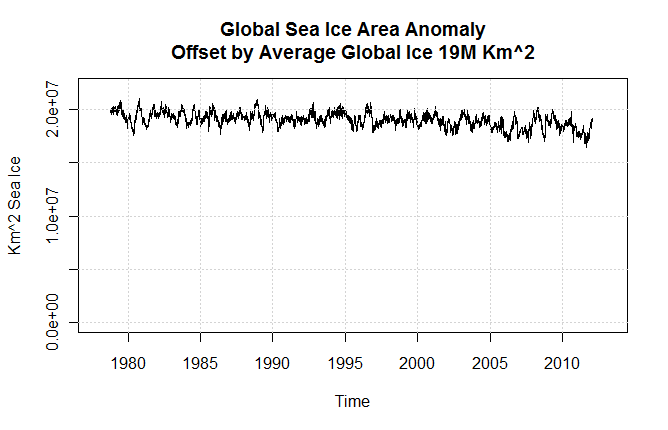 There is wide variability in annual sea ice. The Arctic has been ice-free as recently as the 1920’s, and the early 1800’s before that. 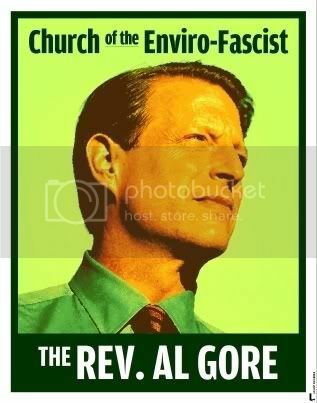 Only a cult member of the True Believer Church of Globaloney would arm-wave over the normal ebb and flow of polar ice. And anyone smarter than a doorknob knows that CO2, anthropogenic or otherwise, has nothing to do with sea ice variability. Changes in ocean currents fully explain the variability, and explains the fact that the Arctic is changing while the Antarctic isn’t. A physicist says: “But on the other hand Dave, when was the last time Earth had a C02 level as high as present (anthropogenic) levels? Only if you are willing to assume, as most proxicologists seem too, that the magical CO2 which supposedly mixes and equilibrates throughout the atmosphere on an almost instantaneous basis, is willing, once it reaches polar latitudes, to lay there like a dead dog just waiting for humans to come along with one of their pristine drillbits to harvest it for examination. As I recall most of the scientific world has been arguing forcefully against such a penetration because the technology didn’t exist to do it and guarantee that pristine lake wouldn’t be contaminated in the process. But then again the Russki’s have never demonstrated that they are much interested in such subtleties . Dave Wendt says: As I recall most of the scientific world has been arguing forcefully against such a penetration because the technology didn’t exist to do it and guarantee that pristine lake wouldn’t be contaminated in the process. Uhhh … absent a citation, perhaps it is rational to be skeptical of this recollection? Current research into Lake Vostok involves attempting to drill through the ice into the lake. Doing so is controversial, due to concern that the lake could become contaminated. Researchers working at Vostok Station produced one of the world’s longest ice cores in 1998. A joint Russian, French, and United States team drilled and analyzed the core, which is 3,623 meters (11,886 ft) long. Ice samples from cores drilled close to the top of the lake have been assessed to be as old as 420,000 years, suggesting that the lake was sealed under the ice cap 15 million years ago. Drilling of the core was deliberately halted roughly 100 meters (300 ft) above the suspected boundary where the ice sheet and the liquid waters of the lake are thought to meet. This was to prevent contamination of the lake from the 60 ton column of freon and kerosene Russian scientists filled the borehole with to prevent it from collapsing and freezing over. In November 2010, when the team allegedly came up with new, ecologically-safe methods of probing the lake without contamination, the scientists submitted a final environmental evaluation of the project to the Antarctic Treaty System’s environmental protection committee and were given the go-ahead to sample the ancient waters. In January 2011 the head of the Russian Antarctic Expedition, Valery Lukin, announced that his team had only 50 meters of ice left to drill in order to reach the water. The researchers then switched to a new thermal drill head with a “clean” silicone oil fluid to drill the rest of the way. Instead of drilling all the way into the water, they would stop just above it, when a sensor on the thermal drill detects free water. At that point, the drill will be stopped and extracted from the bore hole, thereby lowering the pressure beneath it and drawing water into the hole and left for quite some time to freeze, creating a plug of frozen ice in the bottom of the hole. Finally, next summer, the team would drill down again to take a sample of that ice and analyze it. Drilling stopped on 5 February 2011 at a depth of 3,720 meters (12,200 ft) so that the research team could make it off the ice and onto the last flight before the beginning of the Antarctic winter season. The drilling team left by aircraft on 6 February 2011. The Russians resumed drilling into the lake in January 2012, and on 6 February 2012 announced that they had reached the upper surface of the water. I am all for WUWT but don’t have anything in common with the foul-mouthed Mr. Eschenbach. He is not “WUWT’s own,” he is his own, and full of it.